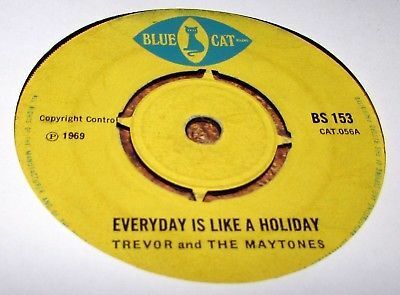 Everyday is like a holiday b/w Have you time by Trevor & The Maytones on 1969 UK Blue Cat BS 153 in VG condition. It has surface scuffs and marks and plays superbly both sides. CLICK ON PLAYER TO HEAR A FULL SOUNDCLIP TAKEN FROM BOTH SIDES OF THE ACTUAL RECORD. BUYER TO PAY POSTAGE AND PACKING. I AM VERY WILLING TO COMBINE POSTAGE AND PACKAGING DISCOUNT CHARGES ON MULTIPLE PURCHASES.